If you think Sony's DualShock and Move controllers are two halves of a well-rounded gaming experience, you might be pleased to know that the firm has dreamt up a hybrid. A patent application filed last year by Kaz and Co. for a "Hybrid Separable Motion Controller" has just surfaced, and it describes a controller that can function as two independent parts or locked together as one. 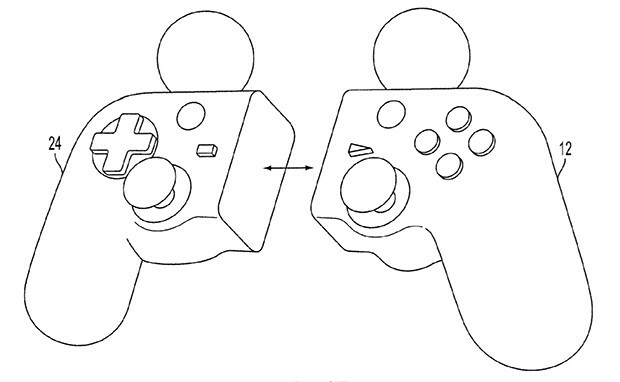 The application also suggests that the location of the controller's halves could be independently tracked when separated and that video games played with the Franken-hardware could switch to configuration-appropriate control schemes. A similar concept has popped up before, but that's no guarantee the contraption will ever see the light of day. In any case, you can hit the bordering source link to dig into the filing and fantasize what such a piece of kit could mean for gaming.